Activity lasts approximately 1.5 hours. Two stops at haunted locations is included. 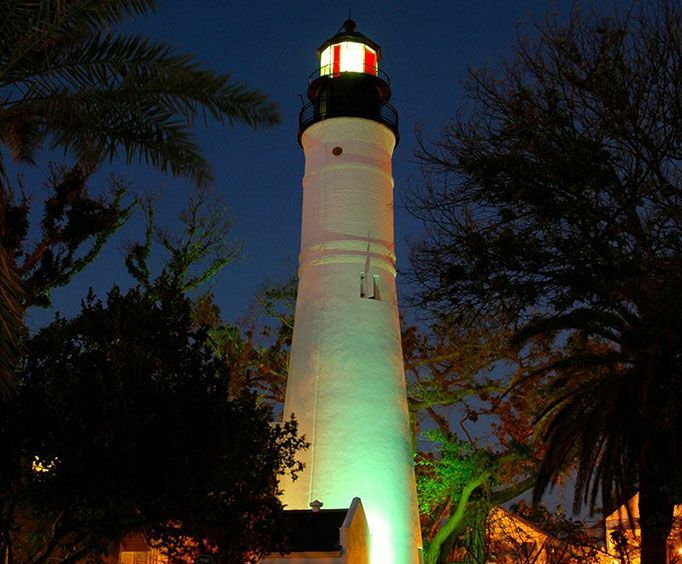 Spend a memorable evening in Key West exploring the ghostly past of this historic and beautiful city with the Ghosts and Gravestone Key West Florida Keys tour. 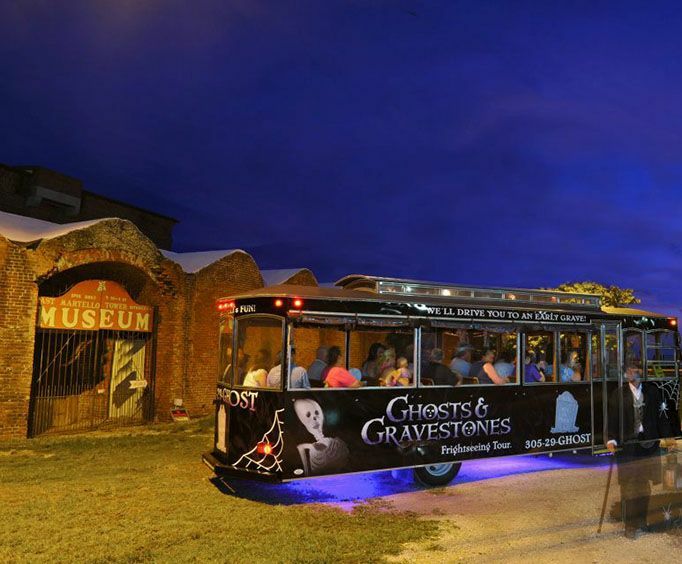 This one and a half hour narrated tour takes you on a trolley through the streets of town during the darkened evening hours. As you travel on the Trolley of the Doomed, your tour guide will share some amazing stories of tragedy, revenge, and mayhem that will truly chill you to the bone. The tour begins by taking you through Old Town, an area of Key West that is known for its 19th century homes, and you will hear haunting tales about the former residents of these homes. The trolley will make a stop at one of the city's Civil War forts, a reputedly haunted building where hundreds perished of the sweeping plague of yellow fever. Inside the fort, you will get to see Robert the Doll, a gift to Gene Otto given to her by a maid skilled in the dark arts of Voodoo. Known to play tricks on unsuspecting victims, this creepy doll is the source of numerous paranormal occurrences. 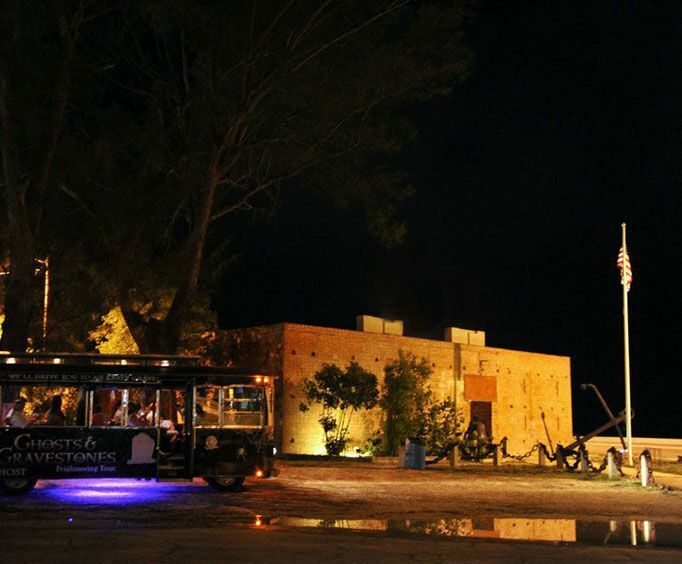 Exclusive night stops include Fort Martello and Shipwreck Treasures Museum. This tour gives you a first hand look at why Haunted American Tours ranks Key West at number four at of all competitors. The Ghosts and GravestoneTour is the perfect way to learn more about the city in a completely unique way, and it is sure to add some excitement to your getaway. Space is limited on this tour, so reserve your seats today! See schedule for a complete list of dates and times. Tour departs from the Conch Train Depot at 501 Front Street. Tour is rated PG-13 and children under 4 are not allowed. Tour length is approximately one hour and thirty minutes.